Comedian Robert Webb’s (Peep Show, That Mitchell And Webb Look) first book, How Not To Be A Boy: Rules For Being A Man, was released in the U.S. earlier this week, promising a searingly honest memoir that deconstructs masculinity. That’s a high bar, but Webb focuses it through his own childhood, beginning with his abusive father, and following the veins of gender conditioning as he struggles with what it means to be a boy, and then a man. Webb’s comic voice pierces even the darkest moments of his life, but the strong reviews How Not To Be A Boy received after its U.K. publication last fall suggest that he does some heavy lifting here as well. Lauren Groff’s adopted home state becomes a living, breathing thing in her latest collection of short stories. In Florida’s lush and precise prose, Groff throws her characters into perilous circumstances both natural and manmade—tropical storms and sinkholes, orphanhood and injury—while keeping a steady hand on the tiller. And for what it’s worth, Groff’s last book, the 2015 novel Fates And Furies, was none other than Barack Obama’s favorite of that year. 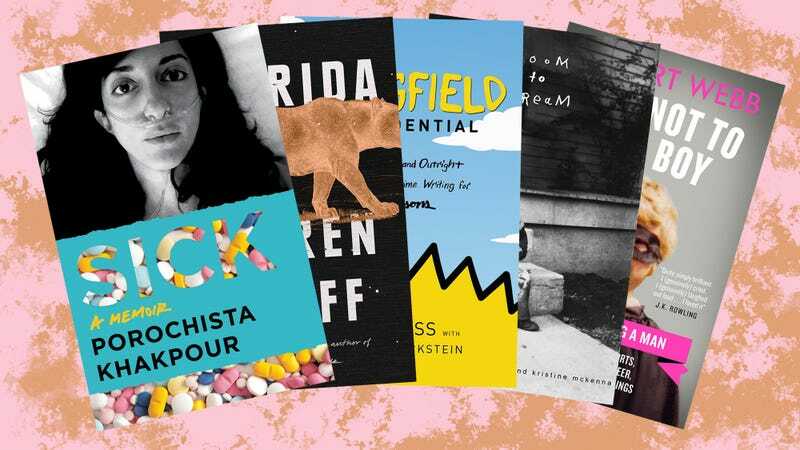 Novelist and essayist Porochista Khakpour joins the likes of Susan Sontag and Susannah Cahalan in elucidating the tolls of chronic illness with her first memoir, Sick. Beginning with depression and tremors when she was a child, the book traces Khakpour’s lifelong struggle with illness, including her addiction to anti-anxiety medications and eventual diagnosis of her late-stage Lyme disease. In addition to being a highly personal account, Sick also captures the way women are often mistreated under America’s broken healthcare system. As The Simpsons nears its 30th year, few can say they were with the show since the beginning. Mike Reiss is one of them, a young TV writer who only took the gig because he didn’t get staffed on another series. In Springfield Confidential, he offers a breezy history of the show from his insider’s perspective, from its dismal early prospects to its astonishing success, with insights aimed squarely at the Comic Book Guy variety of Simpsons fans. David Lynch dislikes explaining his stories, so it’s somewhat ironic that the new biography, Room To Dream, finds him doing just that: Written by Kristine McKenna—who interviewed seemingly every extant, significant person in the filmmaker’s long career—each chapter is followed by a companion piece in which Lynch himself tells his version of that part of his life, often refuting what others just said (or, in appropriately more Lynchian parlance, “remembering things differently”). As with Lynch’s art, Room To Dream is likely to pull back the curtain only so much, but any glimpse inside one of our most fascinating living enigmas is always welcome.